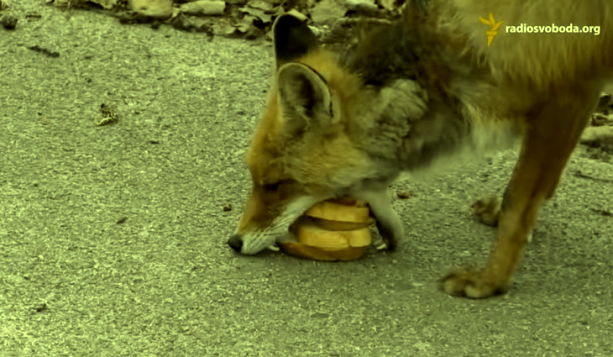 Hungry Fox In Chernobyl, Ukraine Makes Its Own Sandwich. And It's A Five-Decker Sandwich! It's not exactly a secret that foxes are among the more clever mammals around. These often mysterious creatures have good brains on them. That may be so but you wouldn't expect to see them making sandwiches. But this is exactly what a radio crew in Chernobyl, Ukraine witnessed when they came across a lone fox along a desolate road inside the nuclear exclusion zone. The radio crew were parked along the road when a hungry-looking fox approached. The crew started giving the animal with bits of meat which it gobbled up. When slices of bread were thrown at the fox, it proceeded to stack them over each other with a slab of meat pinned within slices of bread. This made it look like the fox was making a sandwich. Holding the five-decker sandwich in its mouth, the fox then casually walks away leaving the stunned and humored radio crew behind. It's a thing of beauty. Maybe someone taught it to do it. Maybe it's the radiation.